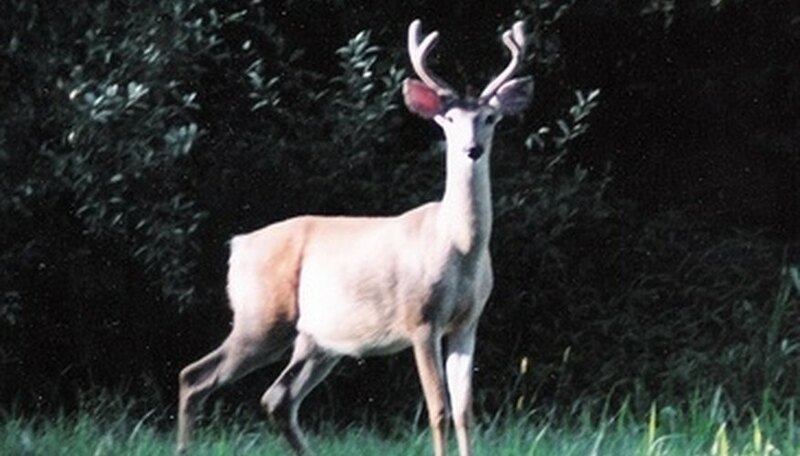 If you want to make a low-cost deer feeder, then a 55-gallon drum is one of your best options. These feeders are simple to make, last forever and cost very little. All you need is a sunny day and about an hour to make your deer feeder. In no time, you will be all set up and waiting to spot your first deer. Paint the drum camouflage. You can simply dip the car-wash sponges in the green, brown and black paint, then sponge-paint the colors onto the drum. You might want to then add some lines for branches or make the sponge blots more leaf-shaped. Of course, if your deer feeder is going to be in snowy woods, you will need white, brown and black paint instead of green, brown and black. Let the paint dry for about an hour. Keep the drum away from moisture during this period of time. Cut a baseball-sized hole in the bottom of one side of the drum. The hole does not need to be perfectly symmetrical, but make sure that it is as close to the ground as possible when the drum is standing upright. Put your drum in place. It is important that you do this before you add the deer feed, since a full 55-gallon drum is far harder to move than an empty one. Make sure that the drum is level or that the side with the hole is leaning slightly downward. Fill the drum with feed. As you fill it, part of the feed will spill out the hole. When the deer come to eat out of the feeder, more feed will slide down and out to replace what has been eaten. Attract deer to your feeder by making a trail leading toward and away from the feeder. Once the deer know the feeder is there, they will come back.